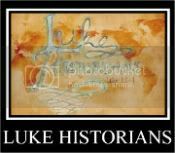 Visit our new website at www.LukeHistorians.com: The Bible Was Written Before It Was Quoted? No Kidding! The Bible Was Written Before It Was Quoted? No Kidding! 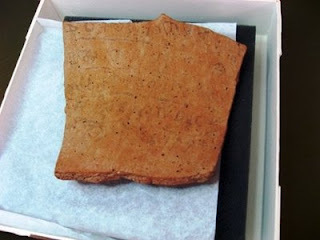 Pottery shard dug up during excavations at Khirbet Qeiyafa, near Israel's Elah valley. 3000-2000 B.C. - Job exclaims how badly he wants his words written in a book - with an iron stylus and lead, to be specific (Job19:23). 1600-1400 B.C. - The Book of the Wars of the LORD is referenced (Numbers 21:14). 1525-1405 B.C. - Moses writes in a book as a memorial to recite to Joshua (Exodus 17:14). Moses writes down all the words of the LORD (Exodus 24:4). Moses writes down the Law and gives it to the priests (Deuteronomy 31:9). 1400 - B.C. - The Book of Jashar is referenced (Joshua 10:13). 1020-971 B.C. - King David writes at least a hundred and twenty-three Psalms. 1000 - B.C. - King David (before ascending the throne) laments the death of King Saul and Jonathan and tells certain men to teach the sons of Judah the song of the bow, and it is written in the Book of Jashar (2 Samuel 1:18). 950-931 B.C. - King Solomon writes 3,000 proverbs, 1,005 songs (1 Kings 4:32) and Ecclesiastes, in which he concludes that the writing of many books is endless (Ecclesiastes 12:12). 640 B.C. - Hilkiah the high priest finds the book of the Law in the House of the LORD (2 Kings 22:8). King Josiah tears his clothes upon discovering that his people have disobeyed YAHWEH's Law (2 Kings 22:11) [Note that this is BEFORE captivity in Babylon]. 627-574 B.C. - Jeremiah writes down the prophecy of Babylon on a single scroll (Jeremiah 51:60). 483-473 B.C. - Queen Esther commands the establishment of the customs of Purim, and they are written in a book (Esther 9:32). 44-95 A.D. - Jude, half-brother of Jesus Christ, quotes the antediluvian writings of Enoch, indicating that the beginnings of written Scripture are far earlier than 3000 B.C. (Jude 1:14-15). 2010 A.D. - Some scientists believe that none of the Bible was written until 600 B.C., and are therefore astonished to find a piece of Hebrew writing from the era of King David. Now I finally understand why discussing the Bible with nonbelievers is like arguing with aliens from a different planet. I was trying to tell them about the real Bible, and all this time they thought I was talking about fragmented Babylonian calenders and love stories copied by hyperventilating Jewish captives. I'm becoming more and more convinced that believers and nonbelievers alike enjoy giving entirely too much credit to pagans. Post Scriptum - Don't anybody start on one of those rants about circular reasoning (as though I don't already know what it is). Haven't you heard of the External and Bibliographic tests? Get with it!